Hartford implementing new downtown opportunities with catalytic projects | Vandewalle & Associates, Inc.
EXCERPTS FROM BIZTIMES.COM: Hartford, a small bedroom community 45 minutes northwest of downtown Milwaukee, is the second-fastest growing municipality in Wisconsin. Home to more than 60 industrial businesses, Hartford companies employ nearly 8,000 people – more than half of its population of 15,000. Over the past decade, Hartford’s major employers, which include Signicast LLC, Broan-NuTone LLC, Steel-Craft Corp. and a Quad/Graphics Inc. plant that employs more than 1,000 people, have asked the city to redevelop the downtown as a way to help them attract and retain employees. Three years ago, the city, HADC, Hartford Area Chamber of Commerce and The Historic Downtown Hartford Business Improvement District hired urban planners Vandewalle & Associates Inc. to conduct a downtown opportunity analysis. 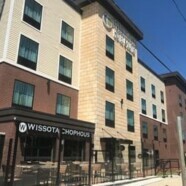 The result has been two catalytic projects in downtown Hartford (the first of which is a new Cobblestone Hotel & Suites 60-room business class hotel with its own Wissota Chophouse restaurant, pictured) and more than 300 new apartment units either opened or planned within the past two years. Read more about the city’s many new downtown investments in the full article here.